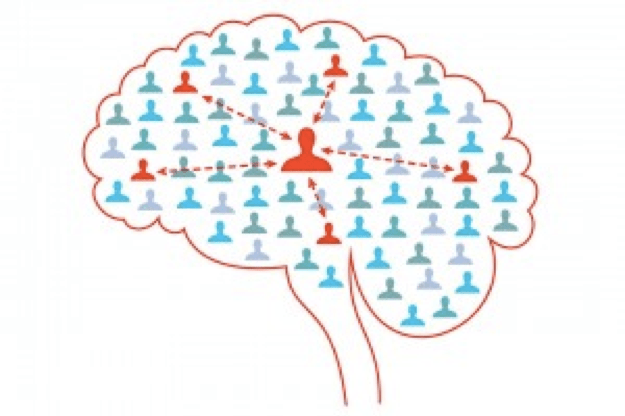 Network theory collided with popular culture following the invention of the “Six degrees of Kevin Bacon” game, where the idea is that everyone in the world is no more than 6 acquaintance links apart. This is epitomised by the network of actors Kevin Bacon has worked with during his film career. Following the advent of social media this number is now thought to be closer to four. Putting Kevin Bacon to one side, scientific knowledge can also be represented as relationships between things. This could be drugs treating diseases, pairs of interacting proteins, phenotypes linked to genes. 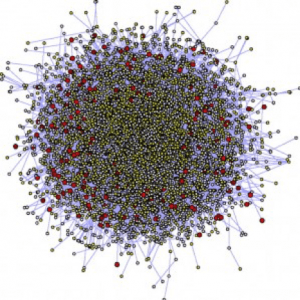 Thousands or millions of such relationships make a knowledge graph or network analysis. SciBite technology enables extraction of these relationships, and in doing so, can uncover knowledge that might otherwise have remained hidden. Let’s start with an example of drug, Alosetron Hydrochloride, which was withdrawn in 2000 due to side effects including severe constipation and ischaemic colitis. A researcher would want to find out more about the mechanisms of reported adverse effects to better understand the science behind a reported event. SciBite provides a range of tools to efficiently explore such mechanisms through a number of approaches. Once we have a set of triples we can start building knowledge graphs, constructed as computer-readable Subject -> Predicate -> Object relationships. Imagine this, not for a handful of entities relating to a single drug, but for many types of entities extracted from >22 million MEDLINE abstracts or for the entire Clinical Trials.gov database. SciBite’s best in class named entity recognition capabilities can help you extract relationships from millions of unstructured documents coming from multiple sources. 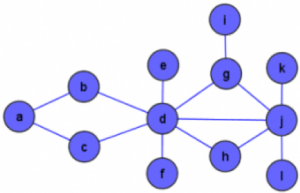 For the scope of this blog post, a graph is defined as a network of related entities. 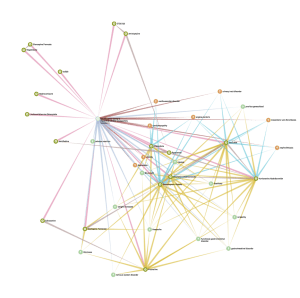 Within a graph, an entity such as a drug, a protein or an indication is called a node, the relationships between these are edges. 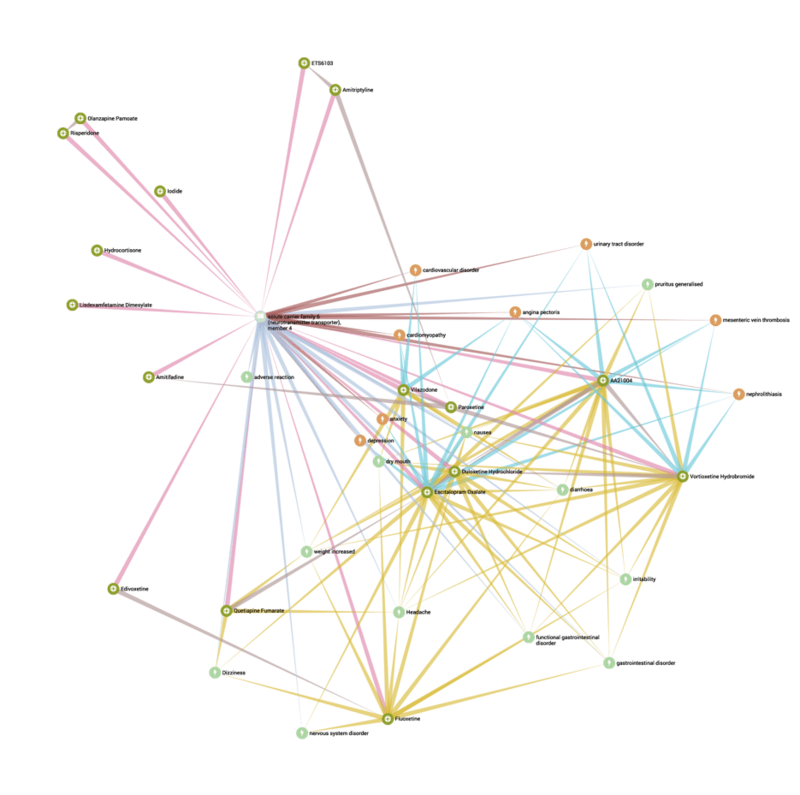 A big challenge with network visualisation is avoiding what is known as a “hairball” (graph 2), but gaining richer insights as might be available from the simple graph 1. To reduce the impact of the hairball effect, SciBite provides a measure of relevance for each relationship based on each entity’s importance in the text and also enables statistics to be applied to filter out the real relationships from the noise. We also partner with Linkurious, whose Linkurious Enterprise software helps companies search, explore and visualize connected data. 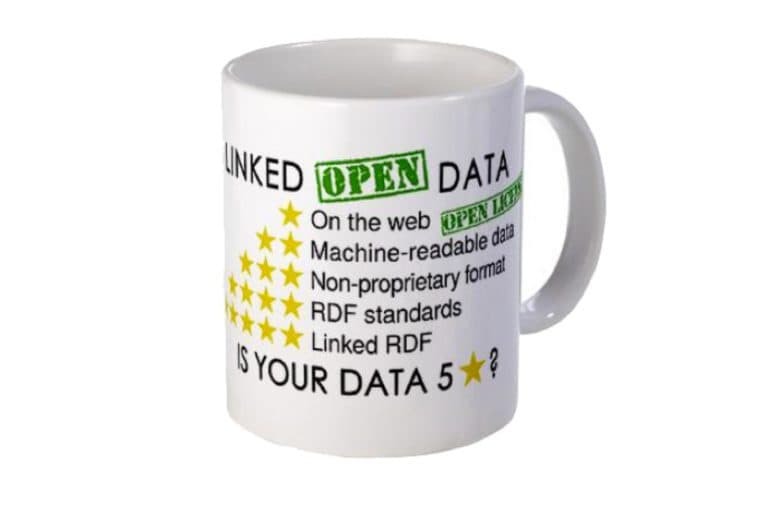 Linkurious Enterprise is compatible with popular graph databases like Neo4j and Titan. It is used by some of the leading drug companies and medical research institutions. 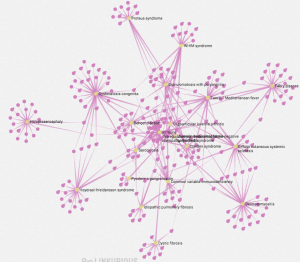 All the following screen shots are from Linkurious visualisations connected to a Neo4j database. The graph database was populated with entities and relationships extracted from unstructured text using TERMite. Linkurious allows the user to interactively build up a graph view starting from a single entity or query. Because the user can start from a clean sheet and build the graph from the bottom up, it helps build a picture of only the things you are interested in and avoid those nasty hairballs. This overview shows Drugs and Adverse Events in MDD trials that are mentioned in conjunction with the Serotonin transporter, SLC6A4. 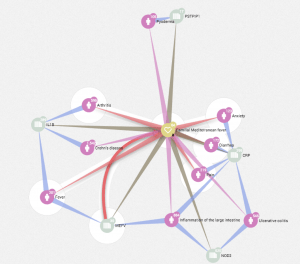 The user can browse the graph an expand nodes of interest or hide those which are less interesting. Relationships are tagged with metadata, such as relevance score, source, co-occurrence count. 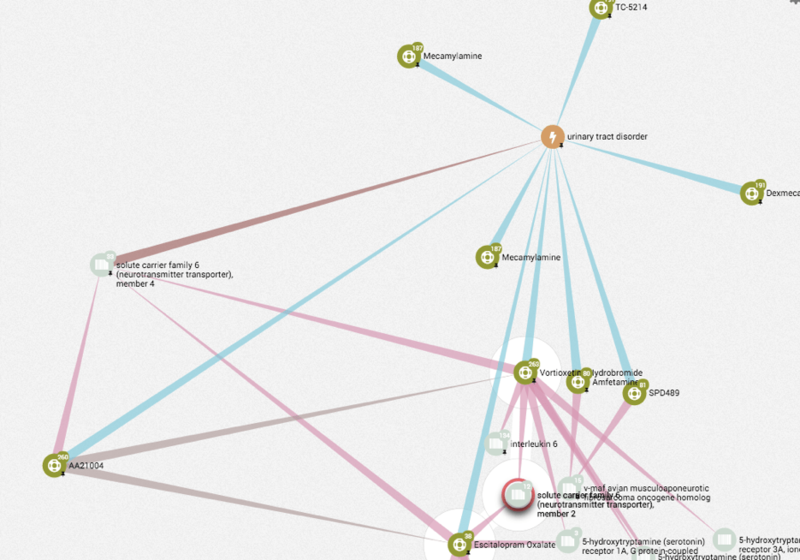 To explore adverse event in more detail, the user can zoom in to specific areas of the graph. In this case, the view is of drugs and targets in the context of Urinary tract disorder as a serious adverse event reported in MDD trials. 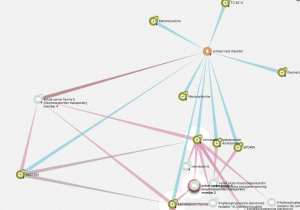 The following graph shows an overview of rare disorders (Yellow) with significant co-occurrence relationships to Crohn’s disease, extracted from Medline. 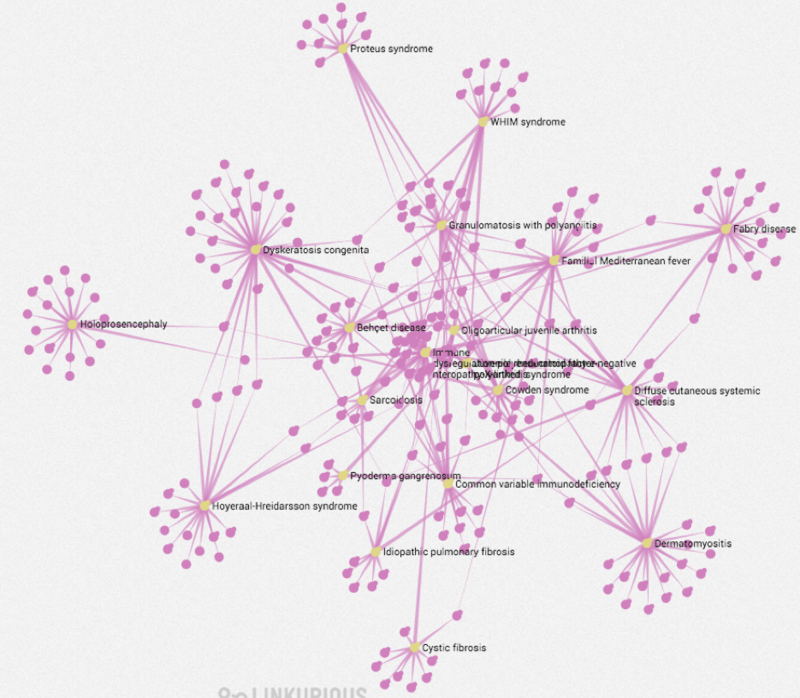 Human Phenotypes (Pink) for each disorder were then mined from Orphanet text summaries. The graph layout below helps to identify those disorders with most phenotypes in common. Focus view to help understand the mechanisms behind the phenotypes. Taking Familial Mediterranean Fever as an example from the graph above, we can see how it links to various phenotypes (Pink) via direct cooccurrence and also via relevant proteins (Green).